Planned Parenthood is an organization I have long supported. They perform many vital functions in the communities where they have clinics. While most of the negative attention they receive is for the abortion services offered at some clinics, they are healthcare facilities that do far more than provide abortions. Sadly, their funding is often under threat by those who oppose reproductive rights for women. In recent years, efforts to defund Planned Parenthood have become a staple of the Republican Party. 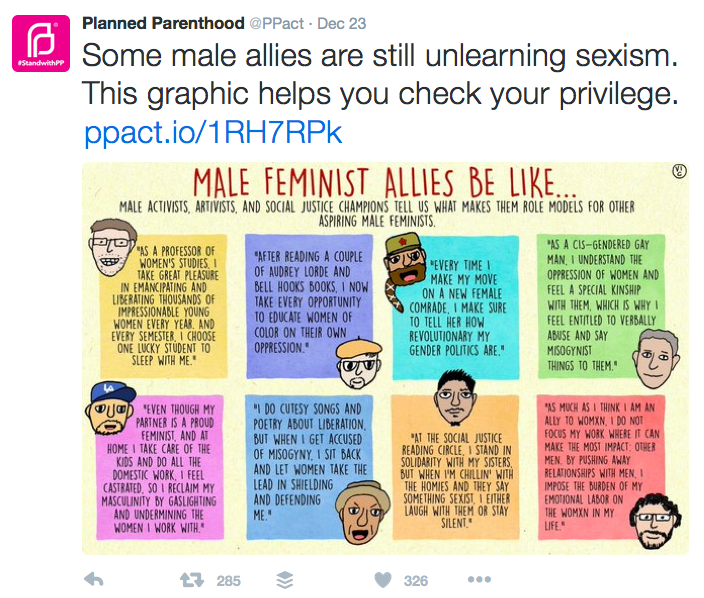 I have to admit that I was disappointed to see the tweet pictured here distributed on their official Twitter account (@PPact) a few days ago. 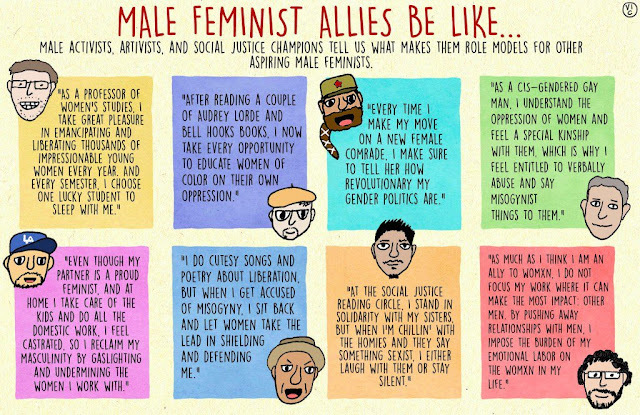 It says, "Some male allies are still unlearning sexism. This graphic helps you check your privilege." Since this image is a bit too small to read easily, I have included a larger version below so you can evaluate it for yourself. The question I'd like to pose is whether this sort of thing is likely to help or hurt Planned Parenthood in terms of support. I realize that opinions will likely differ on this, but it strikes me as unfortunate that an organization in clear need of allies, including male allies, would opt to distribute such a divisive message. I have seen many negative reactions to this tweet, ranging from calm expressions of disappointment to pledges to withdraw one's support and stop donating to Planned Parenthood. I hope that this incident will not affect their donations, as I believe that the work they do is too important. I also hope they would recognize this as well and not jeopardize their support with nonsense like this. 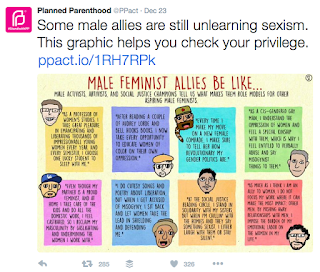 Some of the tweets I saw in the aftermath of this one questioned whether this was something the leaders at Planned Parenthood knew they were promoting or whether it was the result of an intern likely majoring in gender studies getting carried away. The consensus seemed to be that people were hoping for the latter. I realize it must be difficult for large organizations (and presidential candidates) to monitor their social media content when they are increasingly likely to delegate that responsibility to others. But it does seem important that they maintain some oversight so they will at least know what they are promoting.